Student Success is a new unit that includes the offices of Orientation and New Student Programs, Residence Life, and Student Life. It is dedicated to utilizing the resources that already exist within these programs to foster student retention and graduation. “We want to put a much stronger emphasis on how to help students finish once they’ve started,” said Charles Kenyon, dean of students. 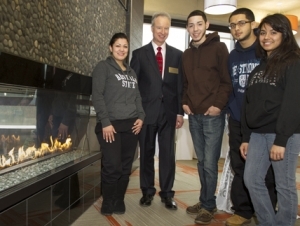 These Fireside Chats are made possible by the renovations to the Campbell Student Union, completed last February, which rebuilt the fireplace in the Fireside Lounge. The fireplace offers a nice touch to an already pleasant space and Kenyon wanted to put it to good use. “My wife suggested Fireside Chats and I thought it was a great idea,” said Kenyon. These chats have offered an informal setting for students to gather and discuss topics such as career development, judicial affairs, and events happening at the Burchfield Penny Art Gallery. Students have also been recognized for awards during the event. “I was happy to present students with the ‘Caught Doing Your Part’ award—an award that recognizes students who intervene to help prevent harm— at one of our Fireside Chats,” said Kenyon. Historically these chats have been well attended, but Kenyon welcomes more. “Often students studying in the area find the topic interesting and put aside their books to join the conversation,” said Kenyon. In future chats, Kenyon hopes to tackle issues like the Tobacco-Free Campus policy. He has also extended an invitation to department directors and would like to involve officers of the United Students Government.